Slow wage growth is a key sign of how far the U.S. economy remains from a full recovery. On some fronts, the economy is steadily healing from the Great Recession. The unemployment rate is down, and the pace of monthly job growth is reversing some of the damage inflicted by the downturn. But the economy remains far from fully recovered. A crucial measure of how far from full recovery the economy remains is the growth of nominal wages (wages unadjusted for inflation). Nominal wage growth since the recovery officially began in mid-2009 has been low and flat. This isn’t surprising—the weak labor market of the last seven years has put enormous downward pressure on wages. Employers don’t have to offer big wage increases to get and keep the workers they need. And this remains true even as a jobs recovery has consistently forged ahead in recent years. Despite the incomplete nature of the recovery, influential voices are already calling for the Federal Reserve to guard against inflation by raising interest rates to slow the economy. The stakes in this debate are high. Macroeconomic policy (including monetary policy) that prioritized very low rates of inflation over low rates of unemployment is a key reason why real wages have stagnated for the vast majority of American workers in recent decades (as we have shown through our Raising America’s Pay initiative). Widespread wage growth will not occur over the coming years if the Federal Reserve prematurely slows the recovery in the name of fighting prospective inflation. The following charts—which will be updated regularly when new data are released—help explain why the Fed should hold off on raising interest rates until nominal wages are growing at a much faster pace. Until nominal wages are rising by 3.5 to 4 percent, there is no threat that price inflation will begin to significantly exceed the Fed’s 2 percent inflation target. And it will take wage growth of at least 3.5 to 4 percent for workers to begin to reap the benefits of economic growth—and to achieve a genuine recovery from the Great Recession. 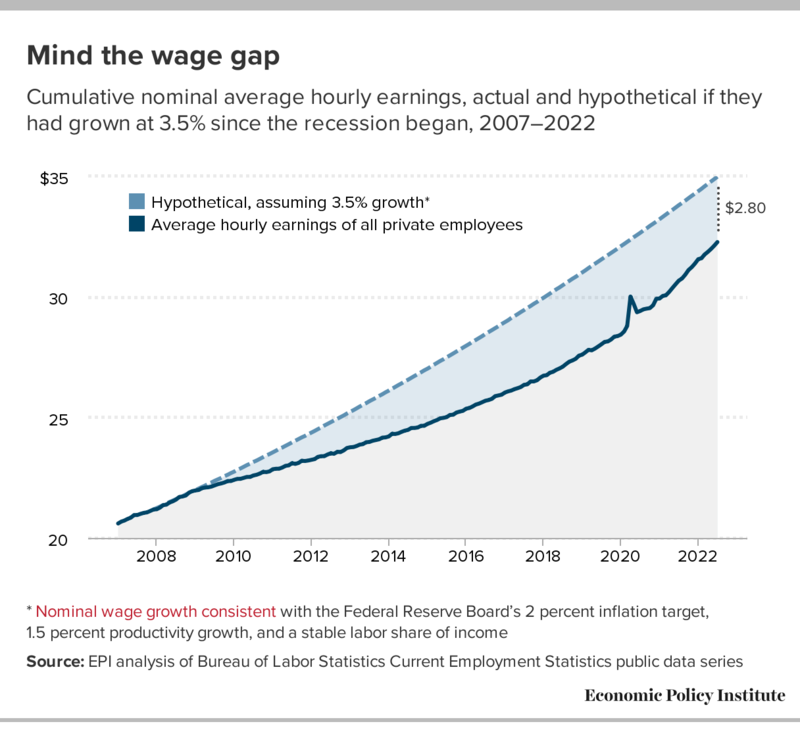 In truth, the economy (and workers) could benefit from consistent wage growth significantly higher than 3.5 percent for an extended period of time. This figure shows the cumulative gap between actual average private-sector nominal hourly earnings and what these earnings would be today had they matched the 3.5 percent wage target since the start of the Great Recession in late 2007. The latest data indicate that average hourly earnings would be $3.49 higher today under this hypothetical scenario. Consistent wage growth at or above 3.5 percent is necessary for workers to recoup some of these unrealized earnings. Notes: Shaded areas denote recessions. Federal Reserve banks’ corporate profits were netted out in the calculation of labor share. 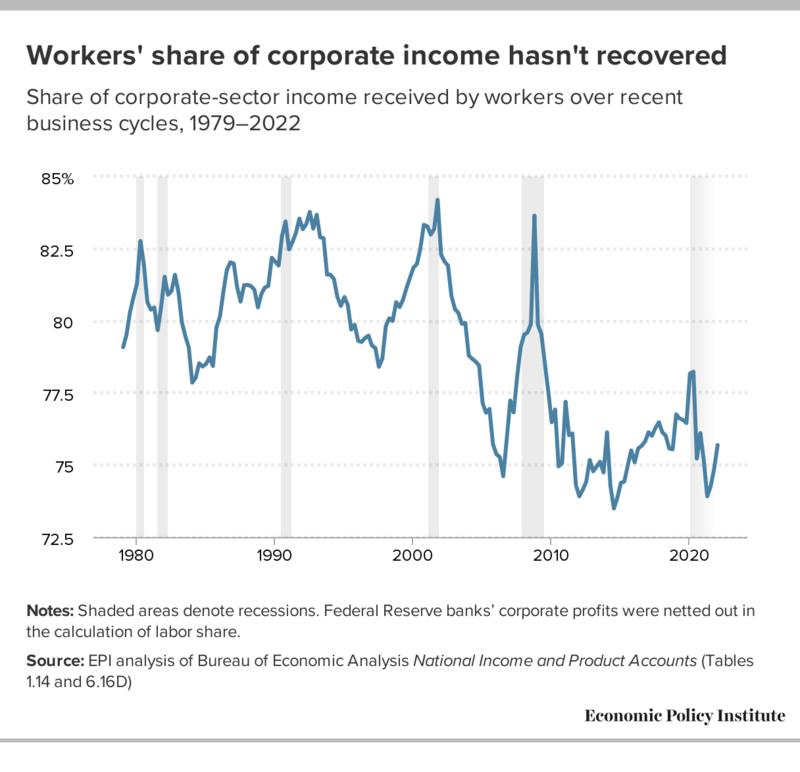 Consistent wage growth of well over 4 percent would also allow the labor share of corporate-sector income—the share of corporate income received by workers in the form of wages and benefits—to begin to make up its recent losses. This figure illustrates the labor share of corporate-sector income since 1979. Typically, the labor share rises during recessions because profits fall much faster than wages during downturns. Then, in the early stages of recovery, the labor share falls significantly as profits increase much more rapidly than wages. Usually, the labor share then rises again late in the expansion as labor markets tighten and workers regain the bargaining power necessary to secure wage increases. As of yet, however, there is little evidence that the labor share has begun any reliable rise following its long fall in the recovery from the Great Recession. 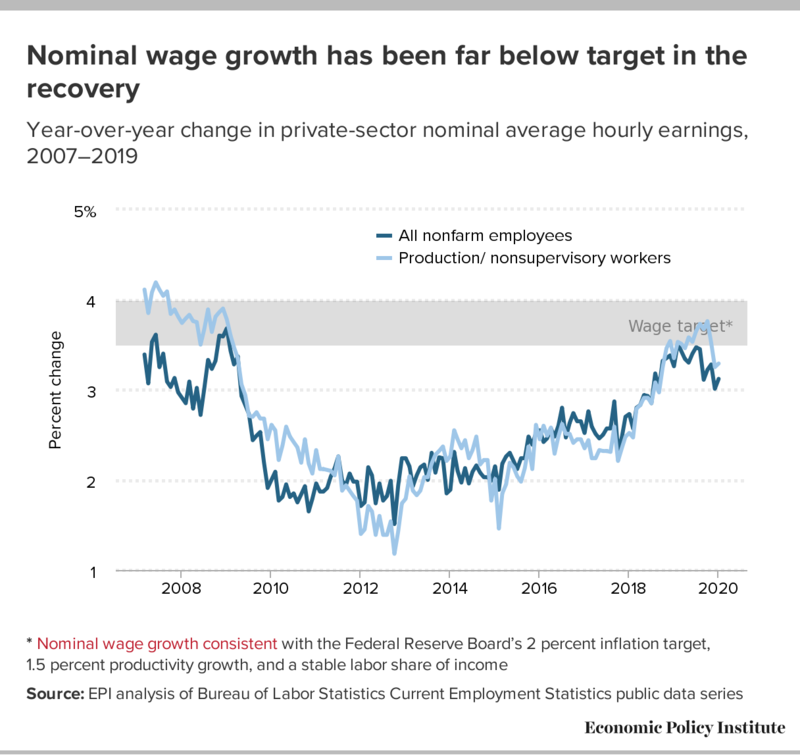 The nominal wage target of 3.5 to 4 percent is defined as nominal wage growth consistent with the Federal Reserve’s 2 percent overall price inflation target, 1.5 to 2 percent productivity growth, and a stable labor share of income. As an example, if trend productivity growth is 1.5 percent, this implies that nominal wage growth of 1.5 percent puts zero upward pressure on overall prices; while an hour of work has gotten 1.5 percent more expensive, the same hour produces 1.5 percent more output, so costs per unit of output are flat. Nominal wage growth of 3.5 percent with 1.5 percent trend productivity growth implies that labor costs would be rising 2 percent annually—and if labor costs were stable as a share of overall output, this implies prices overall would be rising at 2 percent, which is the Fed’s price growth target.